To Chau is listed as an oriental restaurant, but I’ve also seen it described as “actually Vietnamese.” I honestly don’t know what the difference is, and won’t pretend to be more cultured than I am. That disclaimer said, onto the review! I ordered spring rolls (also called summer rolls on the menu). These aren’t the fried egg roll-like things. They’re fresh, and I didn’t write down what’s in them but I know it includes sliced pork, lettuce, noodles, basil and carrots. 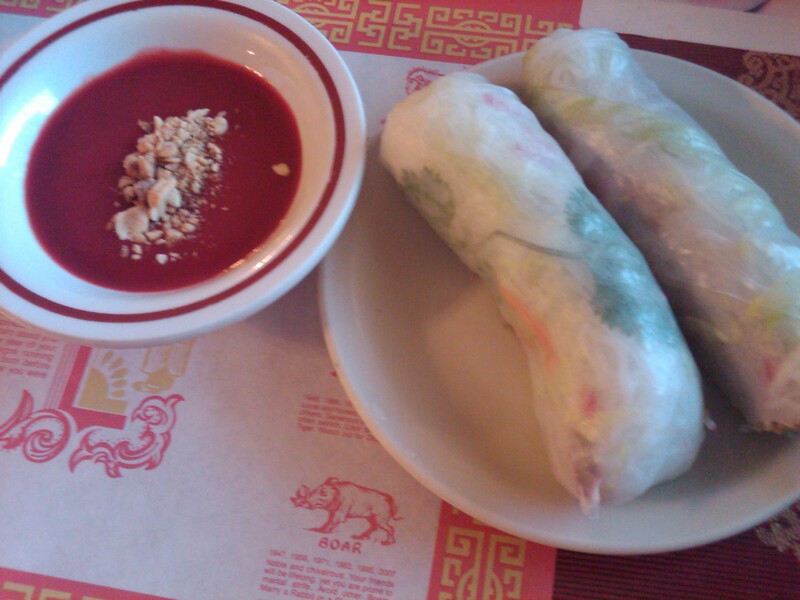 Then wrapped in a rice wrapper, and served with spring roll sauce. And let me tell you, these really did make me think of summer. I have never had fresh spring rolls so I can’t compare them to anything. But the lettuce and carrots gave a nice crunch, while the pork and noodles gave substance. The dipping sauce was sweet to balance with the savory of the roll. Overall, delicious. They won’t hit the spot if you’d rather have fried egg rolls or crab rangoon, but definitely a less greasy alternative for an appetizer. Before I could even finish my spring rolls, my pho (pronounced “fa”) came out. I LOVE pho. I’m definitely a soup girl, and the guys I work with don’t believe soup is a meal, so I can’t ever convince them to have pho for lunch unless it’s my birthday. So although I wish I had more experience to give a good comparison, all I can say is the soup was delicious. I got flank steak in mine. For those who haven’t had pho, you can get lots of different meats. I always go with beef (I know I’m boring). But some places have chicken as well, some places have different types of beef (flank steak, sirloin, brisket, etc.) and then there are things like tripe and tendon I won’t even pretend to be interested in. And real connoisseurs will get a combination of all of these meats. Get it! When my pho came, I immediately added all the jalapenos and several drops of Sriracha. I was also given sprouts, basil and lime to add to the soup. As well as soy sauce, salt and pepper and other condiments left on the table. I thought the soup had a wonderful flavor and only wanted to give it a little more spice. 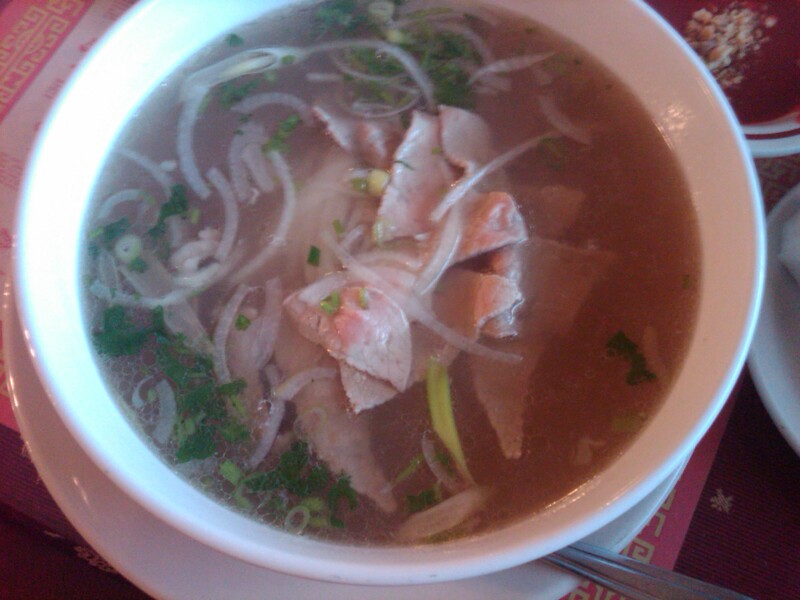 There are two bowl sizes for pho (medium and large), and like most pho places, the servings are really large and reasonably priced. Service is fast, and my waitress kept my water filled, which was nice considering my spicy soup! The restaurant itself isn’t anything exciting to look at but it’s clean and there is lots of room. All-in-all it was absolutely delicious. I left completely satisfied, and can’t wait to go back! Who wants to come? Spring rolls and spring roll sauce. 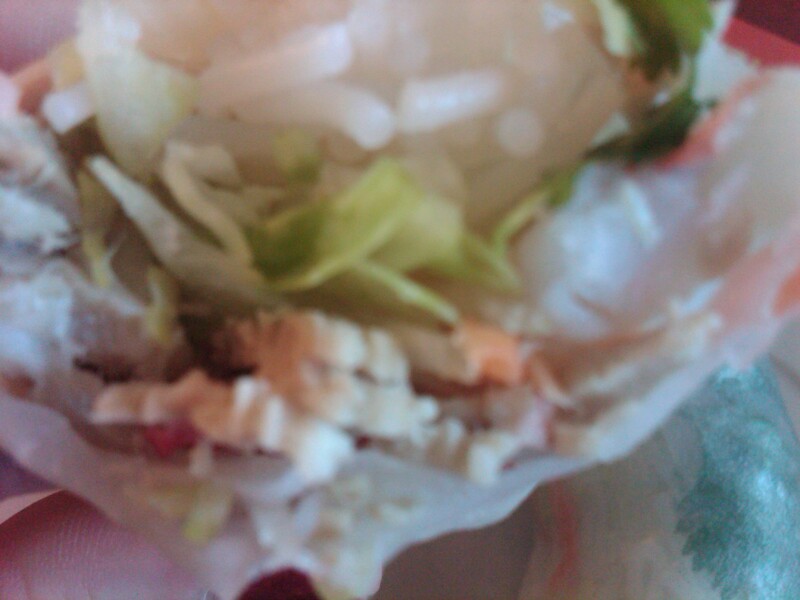 Inside of the spring roll. From top to bottom: Noodles (with basil to the right), lettuce and carrots, pork. The wrapper is really thin. 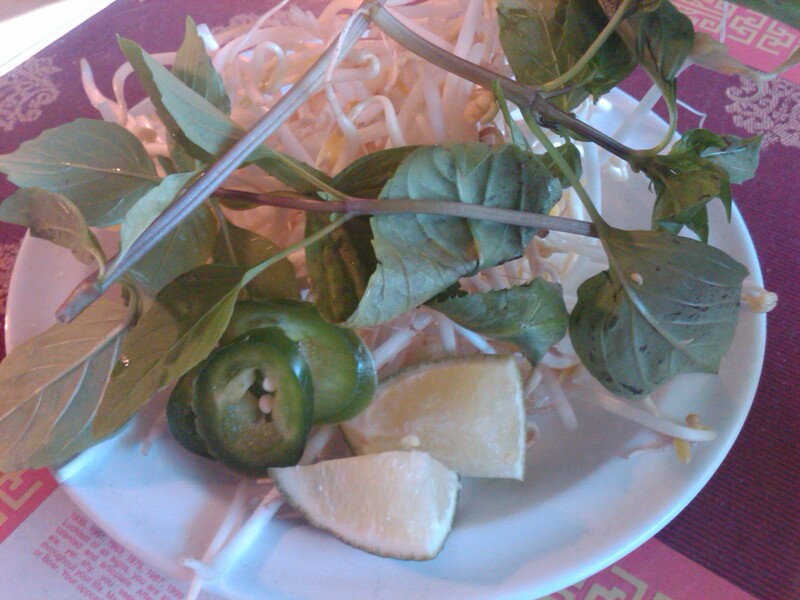 Condiments for pho: sprouts, basil, limes and jalapenos. Pho deliciousness! I’m not sure if I know exactly what’s in it. 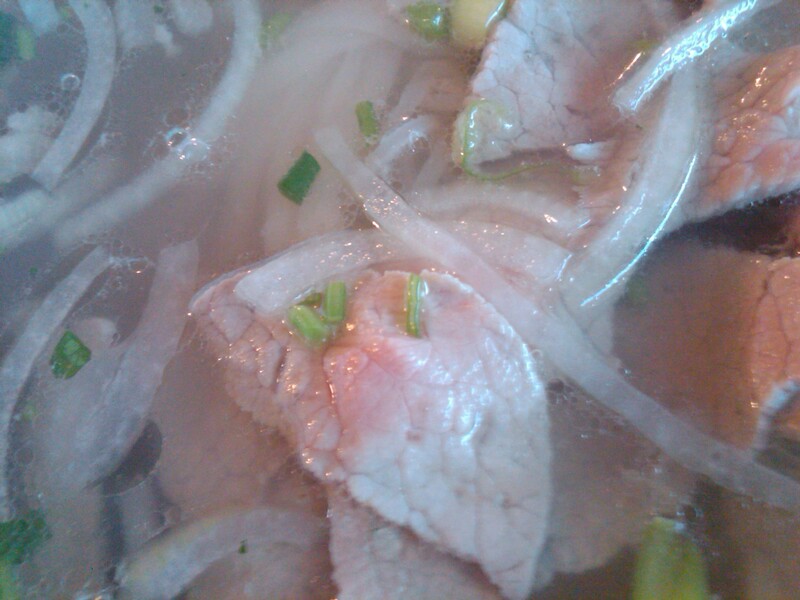 But it’s a beef broth base with pho noodles (YUM! ), white onions, seasonings and green onions. Then you can add anything from the fresh condiments plate (shown above) or anything on the table (salt, pepper, soy sauces, Srirachi, etc.). They also have a spice bowl, which I didn’t ask for because I was happy with how mine tasted by just adding jalapenos and Srirachi. But that’s also available upon request. The spring rolls look so good! The soup exactly like you made it sound good, too.. So I think I’ll actually have to try that some time! So you’re saying you’ve never had pho, right? There’s really nothing scary about it. And nothing to be creeped out about. It’s all stuff you’d eat normally. The broth is made from various beef products and seasonings and fresh spices. And then the stuff they add in is like onions. You get your choice of meat. And then you can pick the extras you like. It’s fun to make it! We’ll have to go sometime! Dude, I want pho now! And I like spring rolls too. Mmmmm! Me too! I’ll eat it with you ANYTIME! Can you eat it since they put the meat in there raw (and the broth cooks it)? I don’t know how all of that works. But, seriously, I’ll go ANYTIME! If you haven’t done Pho Hot Bistro, we should go there. Or the old Pho Hot was reopened as a new pho place (I think I already told you that). Or this place. Or wherever.